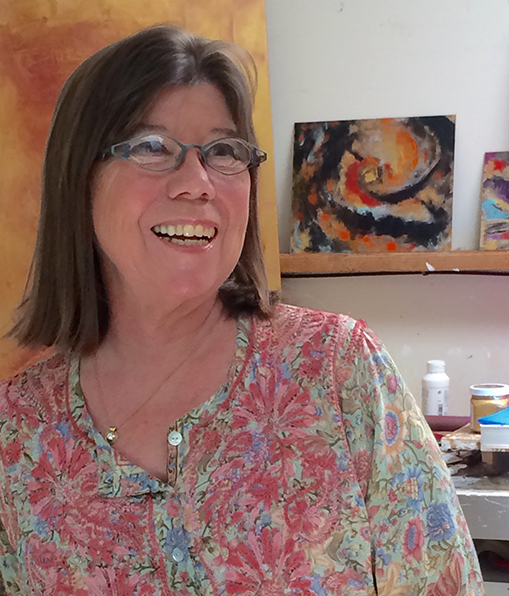 I live and paint in Santa Fe where I have been working since 1987. I work on hard board panels with oil over a golden ground. I have transitioned from watercolor to oil, seascape to landscape, and now abstracts. These new works are often two layers. The second layer is a small painting floated over the face of a larger work, creating a shift, sometimes radical, suggesting layers of reality, glimpses through the veils. The work is atmospheric and suggestive of space and time, this world or others. Oils are applied by hand over a gold textured base which glows through for a rich visual impact that changes with the viewers relationship to the light source. Sizes range from tiny 3×3 to 24×36 as well as series of panels that hang together.